15th August i.e. 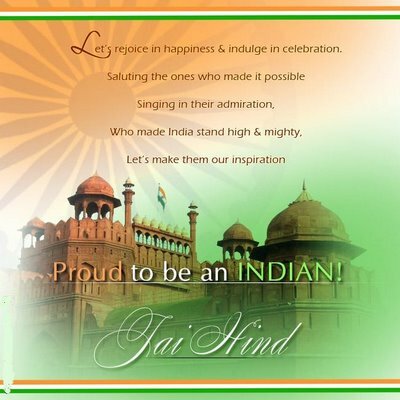 Indian Independence Day is coming and you are still searching for Indian Independence Day quotes, wishes, messages to say or write down to your family and friends. Don't worry, now you don't need to search for them anymore. As here I have compiled down some of the best Independence Day quotes, wishes and messages for you. Just hope you will like this quote compilation and get some Independence Day messages to express your feelings. And above of all this thing, Happy Independence Day To You! ..by crushing individuals, they cannot kill ideas. If the deaf are to hear, the sound has to be very loud. Hail the Soldiers! Hail the Farmers! If yet your blood does not rage, then it is water that flows in your veins. For what is the flush of youth, if it is not of service to the motherland. The Government which attacks its own innocent subjects has no claim to be called a civilised government. Bear in mind, such a government does not survive long. I declare that the blows struck at me will be the last nails in the coffin of the British rule in India. We will face the bullets of the enemies, we are free and will remain free. Happy 66th Independence Day to All. No nation is perfect, it needs to be made perfect. Happy Independence Day! and why not its her 66rd Birth Day. Thousands laid down their lives so that our country breath this day. Never forget their sacrifice. Happy Independence Day! Of Our Nation Till We Live..
may u soar high in the realm of freedom. happy independence day to all indians.!! It is sweet to serve one's country by deeds, and it is not absurd to serve her by words.